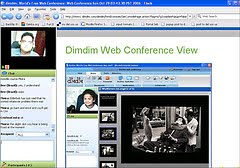 Just over a year ago I wrote about DimDim, which is a free web conferencing tool. I wasn't very impressed and never looked at it again. But over the last couple of days I have re-visited DimDim with a few friends and have become quietly impressed with it. It's FREE - hosts up to 20 people. It was easy to access with broadband Internet. It has great file-sharing abilities - we loaded up files and had no problems seeing them. Also has a quick and easy tool for looking at websites as well as interactive white board. Able to record sessions - audio playback was excellent quality. I also liked the way a transcript of the chat is provided. Had quite a bit of delay at times which made conversations difficult. This problem seemed to diminish when there was only a couple of us in the room. Advertising the meeting takes several steps and confused me - I would like to see that stream-lined. Sharing the mike is clunky - only the meeting organiser can hand out the mic (3 people can speak at a time). This is time-consuming and breaks the flow of conversation. At the same time, it is manageable as long as you have patience with the process. Overall, I think DimDim is great for presentations or teaching sessions but may not be so good if you are wanting discussions or debates. It is fabulous if you do not have access to commercial tools like Elluminate. I don't know how people with dial-up Internet connection would get on but I really like the fact you do not have to download anything onto your computer. 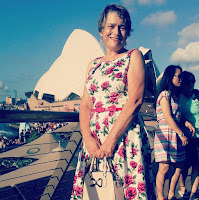 I'm really keen to try it out in a more formal way - if you have an idea for a presentation or meeting I could run via DimDim, please let me know. How have you got on with DimDim? What other free web conferencing tools would you recommend? nice article! no doubt its one of the best free tools around for online meetings. we've used it successfully quite a few times. One caveat though - it does ask you to download screencaster if you plan to do desktop sharing and desktop sharing features doesn't work if you plan to share any application with 3-D rendering. But it's great for sharing presentations. Thanks for that, Anu - I did look at the desk-sharing but had problems downloading the plug-in so didn't go any further. We plan to compare it with Tinychat & WiziQ next week. I came across your blog post today. I am glad to see that you have had a positive experience with Dimdim. At the same time I am a bit concerned with some of the issues mentioned, especially the Plugin install issue you have mentioned in the comment below the post. Could you please provide me with more specific details about the issue faced so I can investigate it and suggest a resolution. In addition, it is possible to set it so the mic is auto-assigned when the attendee’s join (upto the first 3 attendees) by setting it in the Portal – preferences. Have you checked out Mikogo? It's afree desktop-sharing tool for remote support and web conferencing. It allows you to share your screen live over the Web with up to ten people. Drop by our website to find out more http://www.mikogo.com or feel free to contact me if you have any questions.